When I was a little girl, my dad always had a handkerchief on him. When I had the sniffles, he handed me his handkerchief. When I cried, he handed me his handkerchief. When I skinned my knee, he handed me his handkerchief. He would put a handkerchief in his back pocket with the same importance of his wallet and watch. I don’t remember a day that my dad didn’t have a handkerchief on him. When a friend of mine passed away in college, my high school History teacher walked over to me at the funeral and handed me his handkerchief. It reminded me of my father’s actions, and I was comforted. 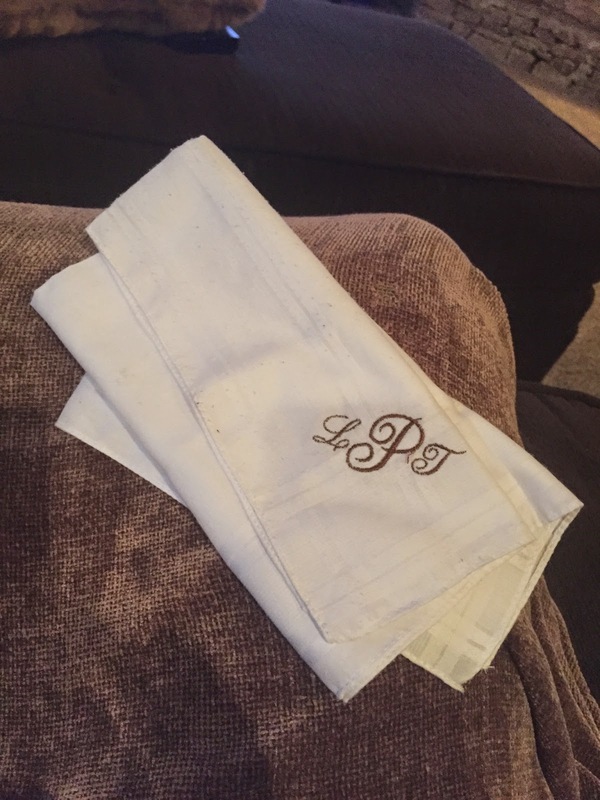 When I got married, I had handkerchiefs monogrammed for him with my maiden initials. It was symbolic of how I would always be his little girl. I also had some made for Todd and myself because I knew that we would both cry on our wedding day. Those handkerchiefs were meant for happy tears. See the handkerchief in my hand in the bottom-left picture? This week, I haven’t been without my handkerchief. I have spent the better part of the last 3 days crying into one while curled up on my husband’s perfectly-made-for-me chest. Anyway, our second pregnancy test at the doctor was on December 2, and we had a bit of a scare. Our hCG levels were not rising as fast as they should have been. However, by December 9, everything was on track, and we scheduled our first ultrasound on Monday, December 15. We were so excited! I asked Todd that week what he was most excited about, and he said, “Watching you be a mother.” Awe! So romantic. Then, he quickly followed it with, “And freaking out over everything.” Ha! He knows me so very well. As we sat in the exam room on Monday, we were like kids on Christmas morning, waiting for their parents to brush their teeth and get the video camera off the charger. Dr. McKinney couldn’t take any longer to come into the room. I was thrilled. I even remember asking Todd if he was excited to see our baby for the first time. We were all smiles and nerves…but good nerves. The ultrasound started, and Dr. McKinney did a good job hiding that maybe things didn’t look quite copacetic. It wasn’t until the nurse left the room without a word that I began to worry. She could see that one of the embryos had implanted. However, the gestational sac did not contain a yolk sac. She proceeded to explain to us that this is called a blighted ovum. She wanted us to return for a follow-up ultrasound on Friday (tomorrow). It was at that point that she really burst our bubble. She informed us that there was less than a 10% chance that this would turn into a viable pregnancy. I realize we still have a 10% chance that this will work. I realize my God is bigger than this problem. That doesn’t take away all of my pain. There is a chance that this isn’t our cycle, and that hurts. I am doing my best to remain positive and remember that God can fix this. However, that doesn’t mean that He will. I have spent the last 3 days crying into my monogrammed handkerchief. That handkerchief comforts me a little, though. It reminds me of when I was a child and life was so easy. Thank you for your continued support, Elisha.